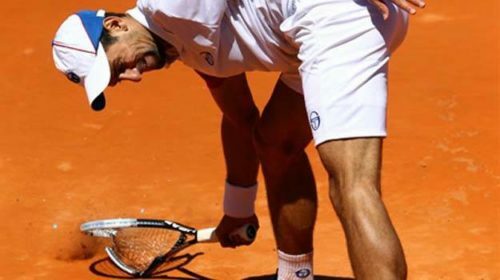 Novak Djokovic gave a glimpse of his old self as he suffered a meltdown at the French Open on Friday. The Serbian tennis star, who made his return earlier this year after being sidelined for almost six months due to an elbow injury, was involved in a tight battle against Spain’s Roberto Bautista Agut on court Suzanne-Lenglen. At 5-5 in the second set tie-breaker, a Djokovic volley deflected off the net and landed wide. The frustration of conceding a set point was clearly evident on the face of the 12-time Grand Slam champion as he smashed his racket thrice. No wonder, the strings were badly distorted. Even as he conceded the second set, Djokovic managed to regain his composure as he went on to pull off a 6-4 6-7 7-6 6-2 win over Agut in an intriguing third-round battle. He wasn’t the only one to let his anger out on the poor racket. Grigor Dimitrov, too, was upset with his performance as he stumbled to a straight-set defeat to Fernando Verdasco.